As you’ve probably heard, Papa Murphy’s was acquired by a private investment firm for $180 million, about $150,000 per store. I think it will turn out to be a good acquisition even with the steep price. Papa Murphy’s has a combination of economic advantages that no other pizza chain has – 1) it doesn’t have the overhead and capital costs of in-store baking, AND 2) it is gaining strong penetration in grocery stores. I admit, from the consumer’s stand point, a take and bake concept is a little confusing at first. “You mean I have to bake my own pizza?” But that impression soon fades. The pizza in its raw form looks fresh and the final product cooked in the home oven is as good as pizza delivery. 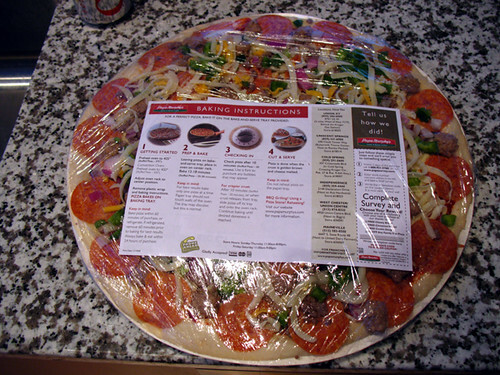 One hurdle overcome by the industry was the difficulty of using a home oven to cook a pizza because it doesn’t brown up well with the ordinary pizza dough recipe. To solve this, chains like Papa Murphy’s increase browning by increasing the sugar percentage and providing a disposable reflective baking tray. Another potential acquisition target is Homemade Pizza, a regional 25 unit chain in IL, MN and DC of classy take-and-bake stores where the average price of an “unbaked” large pizza is almost $20. It seems to be doing well and has great branding. Homemade Pizza pizzas are still priced on the high end because it is made with fresh and local ingredients. The dough is prepared in a commissary to simplify store operations and reduce size requirements. Update: Below is more interesting history on Papa Murphy’s from a November 2009 article in Portland Business Journal. Average store sales are about $535k. Papa Murphy’s is a holding of Charlesbank’s Equity Fund V, a $590 million private equity fund that holds several other food-related concerns, including Captain D’s Seafood and Del Taco. Charlesbank teamed with Papa Murphy’s current president, John Barr, and company management, to recapitalize the pizza chain in a deal announced July 7, 2004. As part of the transaction, Wells Fargo Bank provided a revolving line of credit. Terry Collins formed Papa Murphy’s in 1995 by merging Petaluma, Calif.-based Murphy’s Pizza with Hillsboro-based Papa Aldo’s. Together, the two chains had 140 locations. By the time it partnered with Charlesbank, Papa Murphy’s had grown to about 800 stores in 24 states. In late 2009, it has 1,153 locations in 32 states and two Canadian provinces. It has expanded largely by franchising its concept. More than half its franchisees own only one or two stores. It is the nation’s fifth-largest pizza company. The chain ranked No. 3 in same-store sales growth nationwide last year, according to Nation’s Restaurant News. Only Subway and Taco Bell ranked higher. Same-store sales increased 7.74 percent in Papa Murphy’s stores in 2008 to $534,000 per store. It was the fifth consecutive year Papa Murphy’s reported growth in same-store sales. I’ll just reiterate my concern with this type of concept. I would potentially buy stock in this type of concept, to ride the wave, but from a going into the business standpoint, I would hesitate. Not because I do not think the market is there, but because it is all to easy for other entities to add this onto an existing structure after you go to the trouble and expense to create the market. Think about McDonalds and Dunkin Donuts foray into coffee, once the concept of Premium Coffee was out there, and now look at Starbucks and you may see my point. That being said the concept is good, the build out is cheap etc, and I think it has legs. I also think that the market is too easy to poach as an add on to existing concepts. I agree, Fuwa. If most pizza places offered take and bake, then the value of Papa Murphy’s would be diminished. However, I don’t think the spread of take and bake sold by traditional pizza shops will be that rapid. Take and bake has been around for a while and everyone has seen Papa Murphy’s rapid expansion to 1,150 stores. I think the reason traditional stores haven’t begun pushing take and bake is because of existing customer expectations, location is more important for non-delivered take and bake, and traditional has the disadvantage of a price ceiling and resulting lower margins of a baked pie.